Wyoming is where the untamed spirit of the West. Look at the state map – and in the north-east you will find a small point. 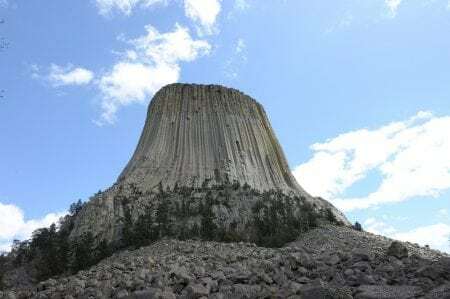 It is a mountain known for its amazing shape, thanks to which it got its name – the Devils Tower. The height of the Tower is about 390 meters, and the age reaches 200 million years. The name of the mountain was established during the appearance of the first settlers in these territories, which gave it the modern name. Ancient Indian legends give us another name – Matȟó Thípila – “Bear Lodge Butte“. Sacred rituals are carried out by Indian tribes in the present times, and the most famous of the ritual celebrations is the Sun Dance, held in June and marking the solstice. Many geologists who were engaged in the origin of the mountain, agreed on the opinion that the impetus for the emergence of this formation was the output of magma to the surface of the Earth. Over time, the temperature dropped, and as a result, the formed array split into vertical structures, somewhat resembling columns. Many hundreds of thousands of years and ruthless erosion have carried out a destructive work on soft sedimentary rocks and have shown our gaze mountain. Similar columns, but much inferior in scale, can be found when visiting the Yellowstone National Park. The unusual shape of the mountain top – a flat plateau with an area of ​​more than 6 thousand m2 – attracts attention and becomes the second home for birds of prey, wild animals, as well as for various types of snakes. The calm existence of the local fauna is ensured by the state that has taken under protection this unique natural object. For centuries, the Indians who inhabited the area near the Devils Tower, from mouth to mouth passed the legend of the origin of the mountain. One of these legends tells of girls, during which a huge bear was attacked while collecting useful herbs and berries. Unable to escape, the girls turned to the Great Spirit. The stone on which they uttered their prayer, suddenly began to grow dramatically towards the sky. The bear, annoyed by the view of the vanishing right from the paws of the prey, in an impulse of frenzy made an attempt to climb this mountain. Many attempts were made by the bear, scratched the entire slope with claws, but could not reach the girls, only leaving “autographs” on each of the slopes. This explains the origin of the famous mountain and its unusual “scratched” slopes. 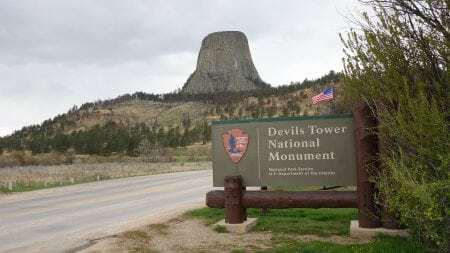 For reference: In 1906, by order of President Theodore Roosevelt, the area around the Devil’s Tower became the first national park in the United States, and the rock itself was declared a national monument. And in 1895 Alice Ripley becomes the first woman to climb the Devils Tower, though with the help of stairs.